Key Lime Cheesecake Creme Brulee Recipe has a surprise inside. 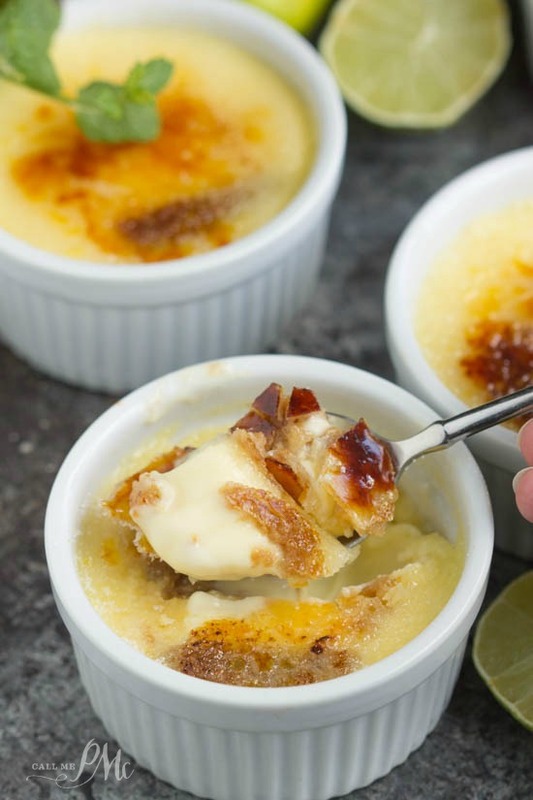 This classic Crème Brûlée has a dollop of Key Lime Cheesecake baked in the center. It’s has a smooth and silky custard with a center of tart, creamy cheesecake and the distinguished caramelized top that everyone loves. 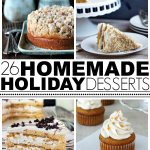 I had a Key Lime Cheesecake Creme Brulee dessert at Blogging Beach Retreat last fall. Prior to having it at this retreat, I didn’t think I liked creme brulee. 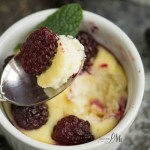 Creme brulee with a hidden square of key lime cheesecake has forever changed my mind! 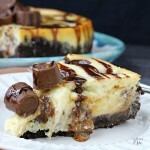 I’ve been craving another this drool-worthy dessert ever since. This creme brulee has a chunk of key lime cheesecake in the center giving an extra pop of flavor, the cheesecake is tart and sweet. 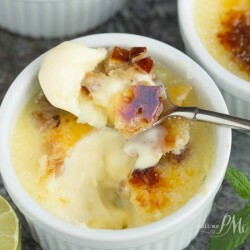 It’s also creamy and rich giving creme brulee that extra kick or richness that it needs. Creme Brulee is super simple and economical to make. That’s why so many restaurants offer it. 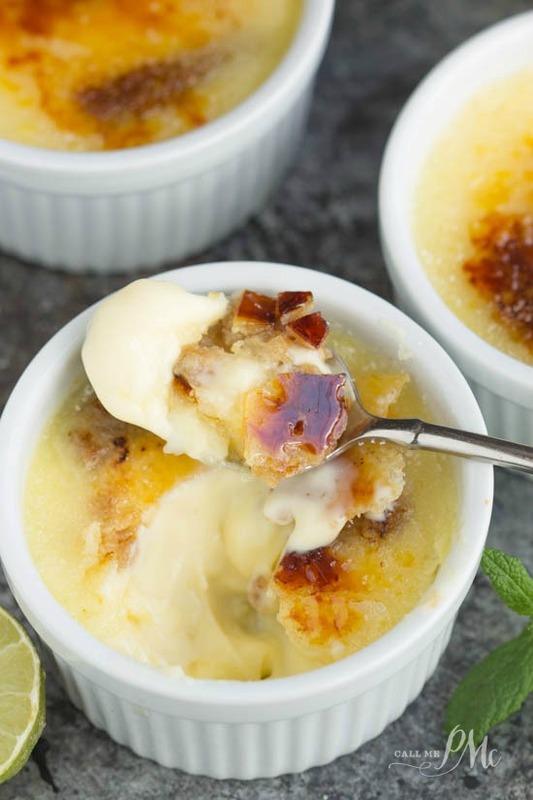 Classic creme brulee has only five ingredients. 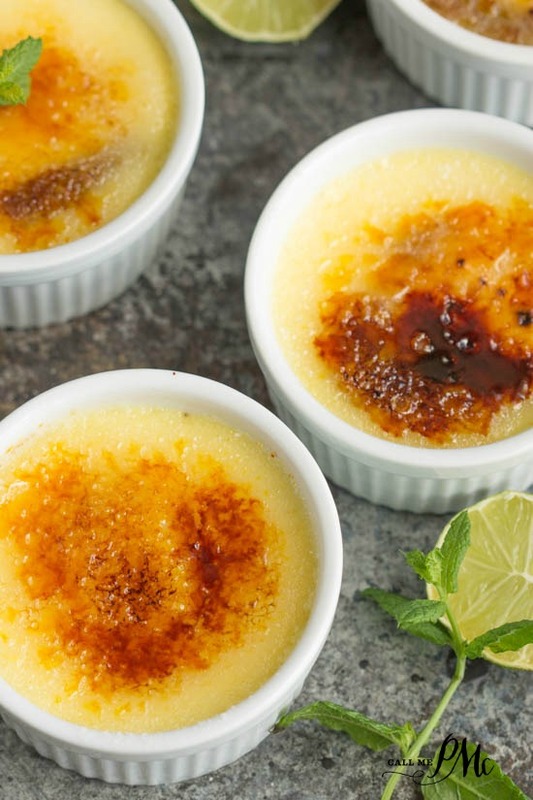 You can make classic creme brulee using this recipe, simply omit the key lime cheesecake. This Key Lime Cheesecake Creme Brulee Recipe takes very little time to make and it needs to be made beforehand and chilled. This makes it ideal for entertaining. When entertaining, anything you can do early is a bonus. You can use 1/2 pod vanilla bean and scrape the seeds out in this recipe. However, vanilla beans are expensive where I live. I find it more economical to use a good quality vanilla extract to keep the cost down. You may use either. Kitchen torch safety: Kitchen torches are usually fueled with propane. Propane gas is highly flammable. They should be kept away from heat, open flame and prolonged exposure to sunlight. Use a propane gas torch in a well-ventilated area. When lighting, face the flame away from you. Children should never use a kitchen torch without adult supervision. How to use the kitchen blow torch: Holding the kitchen torch 3 to 4 inches from the custard, caramelize sugar on each custard by heating with the torch about 2 minutes. Move the flame continuously in a circular pattern until the sugar is melted and lightly golden brown. 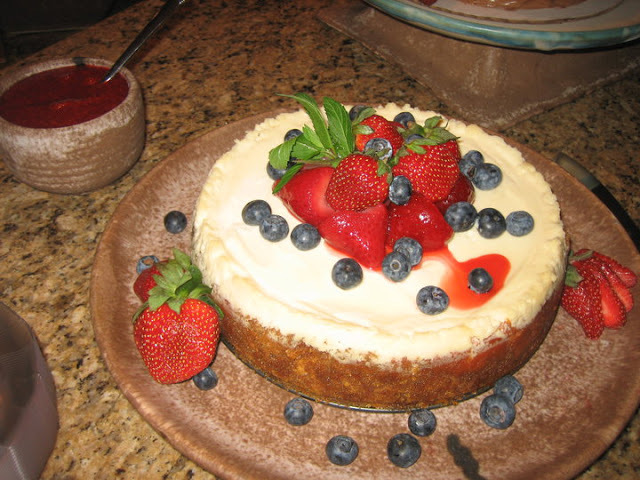 Key Lime Cheesecake Creme Brulee recipe is the best of two desserts combined into one. A rich and tart key lime cheesecake is baked into the center of classic creme brulee. 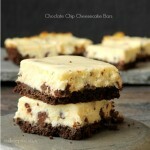 This is a great dessert for entertaining since it needs to be made early in the day then chilled. Arrange 8 4-inch ramekins on a large rimmed baking sheet. 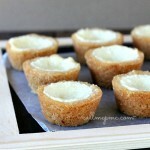 Cut the Key lime cheesecake into 8 even pieces and place in the center of each ramekin. In a medium saucepan over medium heat, combine heavy cream, sugar, and salt. While the cream is heating, whisk the egg yolks together. Add vanilla bean or vanilla extract and whisk. Gradually add 1/4 cup of the hot cream mixture to the yolks, whisking constantly. Continue adding 1/4 hot cream mixture to the yolks until all combined. Carefully pour or ladle the custard into the ramekins being careful to keep the Key lime cheesecake in the center of the ramekin. Fill ramekin to the rim. Place the baking sheet with the ramekins in it in the oven. Add water to the baking sheet until 1 about 1 inch deep. Bake the creme brulee until the edges have set but the center still trembling when the ramekins are gently shaken about 20 to 25 minutes. Remove the ramekins from oven and allow to cool on a wire rack until completely cooled. 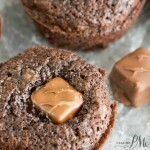 Place in an airtight container or wrap individually and refrigerate for at least 2 hours or up to 3 days. Remove the creme brulee from the refrigerator at least 30 minutes prior to browning the sugar on top. To serve: Sprinkle the top of each custard with a thin even layer of sugar, about 1 tablespoon each. Use a kitchen blowtorch or oven broiler to melt and caramelize the sugar. You want the sugar to form a crispy top. Allow the creme brulee to sit about 5 minutes before serving. *I find it easier to use a large measuring bowl with a spout to pour the mixture into the ramekins. **To use the kitchen blow torch: Holding the kitchen torch 3 to 4 inches from the custard, caramelize sugar on each custard by heating with the torch about 2 minutes. Move the flame continuously in a circular pattern until the sugar is melted and lightly golden brown. Hi Jenny. I found Edwards individual pie slices. I found them at Walmart Supercenter. They were located with the whole frozen pies in the standup freezers. Hope this helps. 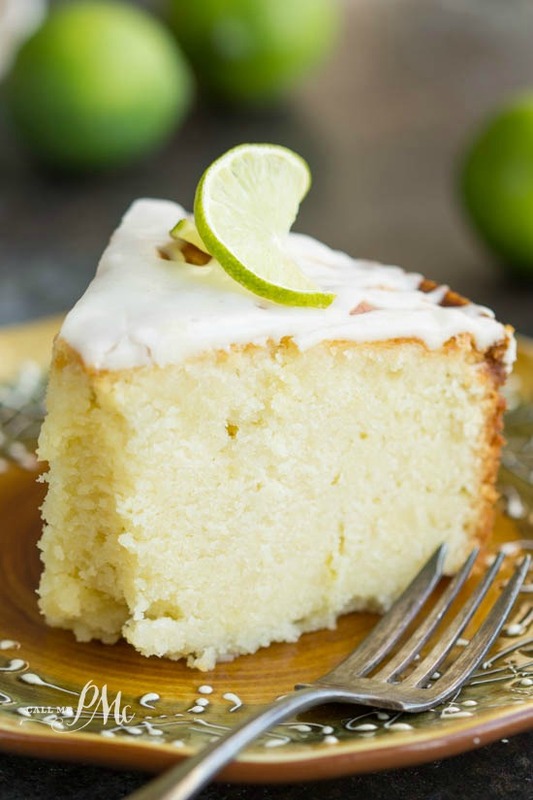 What brand name at the local grocery has a key lime cheesecake in individual slices for purchase? Any advice? Creme brûlée is my husband’s absolute favorite. I love it too, but I bet I’d love this version even more! 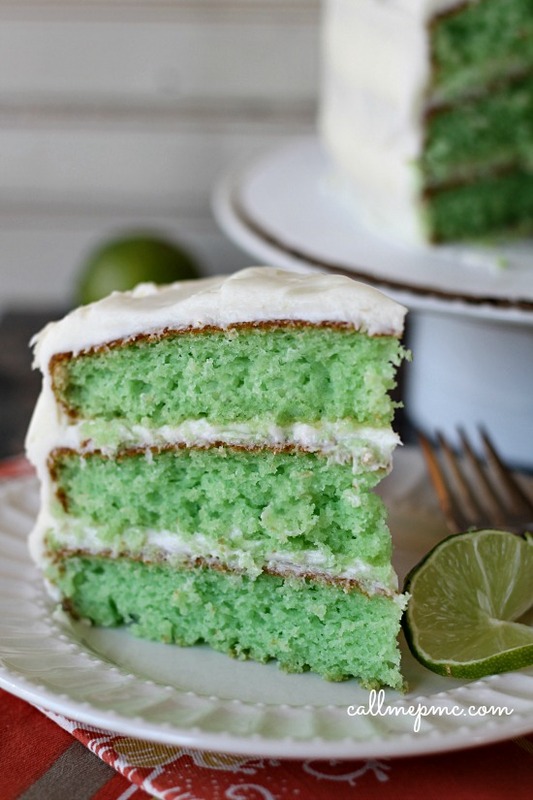 Love the key lime cheesecake center!